For recent builds of the Windows 10 Technical Preview, when Microsoft has released ISO images of a build they have elected not to release ISO's of Enterprise Edition. The most recent Enterprise edition ISO available is for build 10074. While it is possible to download and install that build, then upgrade to the more recent builds using windows update, having install media for the current version would make things much easier. The good news is, all of the bits for Enterprise edition are included in the ISO of Windows 10 Pro Technical Preview, and with a few simple commands it's possible to change from Pro to Enterprise edition. To get started, download the latest Windows 10 Pro Technical Preview ISO. As of the time of this writing, the image currently available is build 10162. Extract the contents of the iso into a temporary directory. In my example, I use D:\10162\. After updating to the recently released build #10041 of the Windows 10 Techincal Preview, I found that Windows Update wasn't working for me. The old style Windows Update was no longer available from the Control Panel. 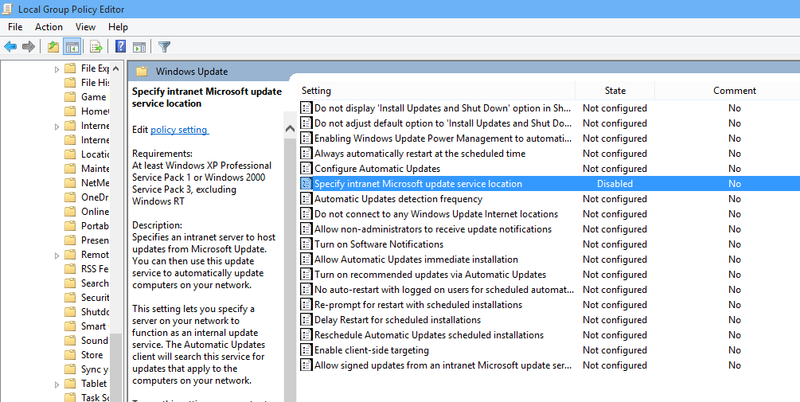 The new Windows Update in the modern "Settings" app showed that I had no updates available, and last checked for updates on 2/2/2015. If I clicked the Check Updates button, nothing seemed to happen, or occasionally the "last checked" date would flicker briefly, but not change. This PC is a member of a domain, with an active System Center Configuration Manager 2012R2 server. As such, it would normally get it's updates from the SCCM server (which in turn pulls them through the associated WSUS server.) However, SCCM doesn't offer updates for the Technical Preview, so that isn't an option when running a preview build of Windows 10.